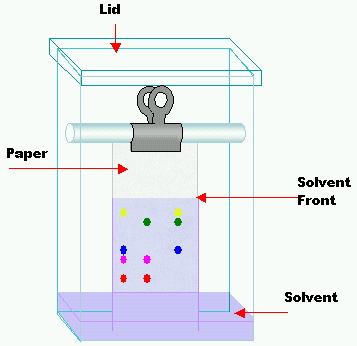 English: Diagram of a TLC (Thin Layer Chromatography) tank. English: This diagram was created with the drawing tools that come with Microsoft Word. See Wikipedia:Historical_archive/How to draw a diagram with Microsoft Word for advice on how to draw diagrams like this. File:Chromatography tank.svg هو نسخة متجهية لهذه الصورة. ينبغي أن تستخدم الصورة المتجهية عندما تكون أعلى جودةٌ من الصورة النقطية. حالي 13:25، 24 سبتمبر 2011 357 × 346 (16 كيلوبايت) Hazard-SJ I cropped the top part of the file. 09:57، 30 نوفمبر 2006 357 × 349 (13 كيلوبايت) Ewen Diagram of TLC tank drawn by Theresa Knott. Copied from wikipedia This diagram was created with the drawing tools that come with Microsoft Word. See Wikipedia:How to draw a diagram with Microsoft Word for advice on how to draw diagrams like this.